Executive Management, Operations, and Sales are the three primary roles driving Business Intelligence (BI) adoption in 2018. Dashboards, reporting, end-user self-service, advanced visualization, and data warehousing are the top five most important technologies and initiatives strategic to BI in 2018. Small organizations with up to 100 employees have the highest rate of BI penetration or adoption in 2018. Organizations successful with analytics and BI apps define success in business results, while unsuccessful organizations concentrate on adoption rate first. 50% of vendors offer perpetual on-premises licensing in 2018, a notable decline over 2017. The number of vendors offering subscription licensing continues to grow for both on-premises and public cloud models. Fewer than 15% of respondent organizations have a Chief Data Officer, and only about 10% have a Chief Analytics Officer today. These and many other fascinating insights are from Dresner Advisory Service’s 2018 Wisdom of Crowds® Business Intelligence Market Study. In its ninth annual edition, the study provides a broad assessment of the business intelligence (BI) market and a comprehensive look at key user trends, attitudes, and intentions. The latest edition of the study adds Information Technology (IT) analytics, sales planning, and GDPR, bringing the total to 36 topics under study. “The Wisdom of Crowds BI Market Study is the cornerstone of our annual research agenda, providing the most in-depth and data-rich portrait of the state of the BI market,” said Howard Dresner, founder and chief research officer at Dresner Advisory Services. “Drawn from the first-person perspective of users throughout all industries, geographies, and organization sizes, who are involved in varying aspects of BI projects, our report provides a unique look at the drivers of and success with BI.” Survey respondents include IT (28%), followed by Executive Management (22%), and Finance (19%). 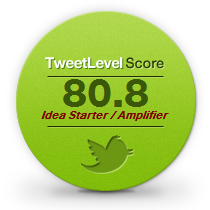 Sales/Marketing (8%) and the Business Intelligence Competency Center (BICC) (7%). Please see page 15 of the study for specifics on the methodology. Executive Management, Operations, and Sales are the three primary roles driving Business Intelligence (BI) adoption in 2018. Executive management teams are taking more of an active ownership role in BI initiatives in 2018, as this group replaced Operations as the leading department driving BI adoption this year. The study found that the greatest percentage change in functional areas driving BI adoption includes Human Resources (7.3%), Marketing (5.9%), BICC (5.1%) and Sales (5%). Making better decisions, improving operational efficiencies, growing revenues and increased competitive advantage are the top four BI objectives organizations have today. Additional goals include enhancing customer service and attaining greater degrees of compliance and risk management. The graph below rank orders the importance of BI objectives in 2018 compared to the percent change in BI objectives between 2017 and 2018. Enhanced customer service is the fastest growing objective enterprises adopt BI to accomplish, followed by growth in revenue (5.4%). Dashboards, reporting, end-user self-service, advanced visualization, and data warehousing are the top five most important technologies and initiatives strategic to BI in 2018. The study found that second-tier initiatives including data discovery, data mining/advanced algorithms, data storytelling, integration with operational processes, and enterprise and sales planning are also critical or very important to enterprises participating in the survey. Technology areas being hyped heavily today including the Internet of Things, cognitive BI, and in-memory analysis are relatively low in the rankings as of today, yet are growing. Edge computing increased 32% as a priority between 2017 and 2018 for example. The results indicate the core aspect of excelling at using BI to drive better business decisions and more revenue still dominate the priorities of most businesses today. Sales & Marketing, Business Intelligence Competency Center (BICC) and Executive Management have the highest level of interest in dashboards and advanced visualization. Finance has the greatest interest in enterprise planning and budgeting. Operations including manufacturing, supply chain management, and services) leads interest in data mining, data storytelling, integration with operational processes, mobile device support, data catalog and several other technologies and initiatives. It’s understandable that BICC leaders most advocate end-user self-service and attach high importance to many other categories as they are internal service bureaus to all departments in an enterprise. It’s been my experience that BICCs are always looking for ways to scale BI adoption and enable every department to gain greater value from analytics and BI apps. BICCs in the best run companies are knowledge hubs that encourage and educate all departments on how to excel with analytics and BI. Insurance companies most prioritize dashboards, reporting, end-user self-service, data warehousing, data discovery and data mining. Business Services lead the adoption of advanced visualization, data storytelling, and embedded BI. Manufacturing most prioritizes sales planning and enterprise planning but trails in other high-ranking priorities. Technology prioritizes Software-as-a-Service (SaaS) given its scale and speed advantages. The retail & wholesale industry is going through an analytics and customer experience revolution today. Retailers and wholesalers lead all others in data catalog adoption and mobile device support. Insurance, Technology and Business Services vertical industries have the highest rate of BI adoption today. The Insurance industry leads all others in BI adoption, followed by the Technology industry with 40% of organizations having 41% or greater adoption or penetration. Industries whose BI adoption is above average include Business Services and Retail & Wholesale. The following graphic illustrates penetration or adoption of Business Intelligence solutions today by industry. Dashboards, reporting, advanced visualization, and data warehousing are the highest priority investment areas for companies whose budgets increased from 2017 to 2018. 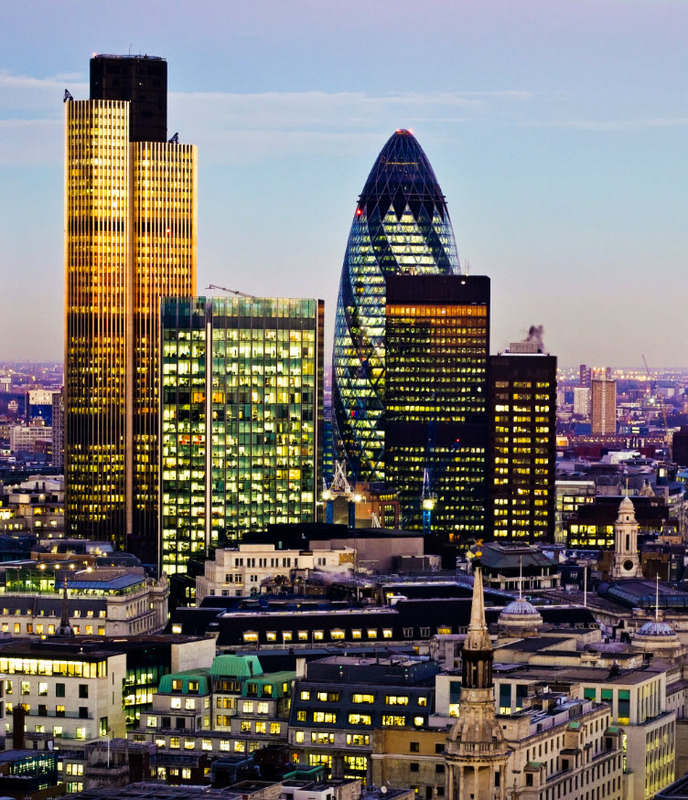 Additional high priority areas of investment include advanced visualization and data warehousing. The study found that less well-funded organizations are most likely to lead all others by investing in open source software to reduce costs. Small organizations with up to 100 employees have the highest rate of BI penetration or adoption in 2018. 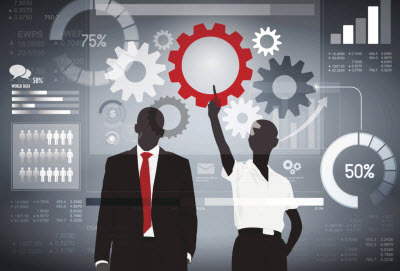 Factors contributing to the high adoption rate for BI in small businesses include business models that need advanced analytics to function and scale, employees with the latest analytics and BI skills being hired to also scale high growth businesses and fewer barriers to adoption compared to larger enterprises. BI adoption tends to be more pervasive in small businesses as a greater percentage of employees are using analytics and BI apps daily. Executive Management is most familiar with the type and number of BI tools in use across the organization. The majority of executive management respondents say their teams are using between one or two BI tools today. Business Intelligence Competency Centers (BICC) consistently report a higher number of BI tools in use than other functional areas given their heavy involvement in all phases of analytics and BI project execution. IT, Sales & Marketing and Finance are likely to have more BI tools in use than Operations. Enterprises rate BI application usability and product quality & reliability at an all-time high in 2018. Other areas of major improvements on the part of vendors include improving ease of implementation, online training, forums and documentation, and completeness of functionality. Dresner’s research team found between 2017 and 2018 integration of components within product dropped, in addition to scalability. The study concludes the drop in integration expertise is due to an increasing number of software company acquisitions aggregating dissimilar products together from different platforms. 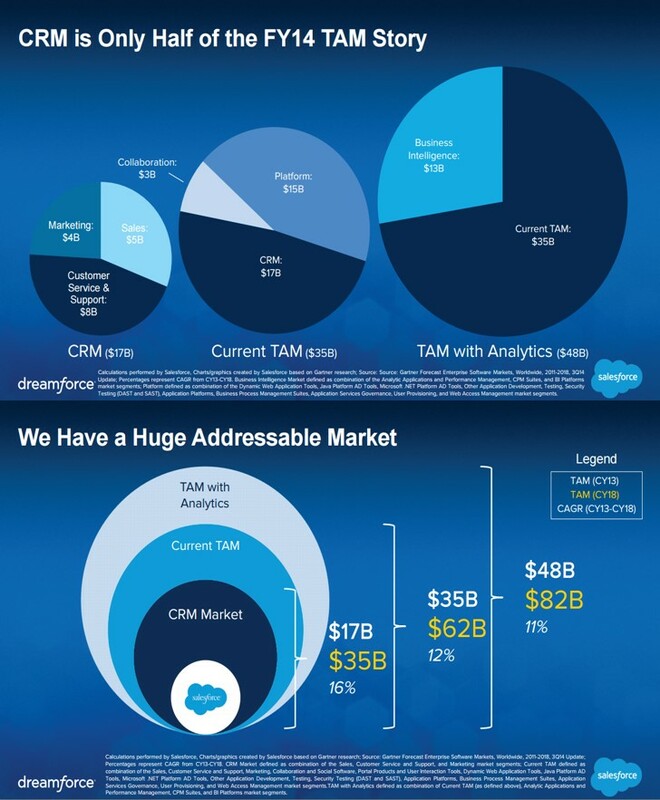 Salesforce (NYSE:CRM) estimates adding analytics and Business Intelligence (BI) applications will increase their Total Addressable Market (TAM) by $13B in FY2014. 89% of business leaders believe Big Data will revolutionize business operations in the same way the Internet did. 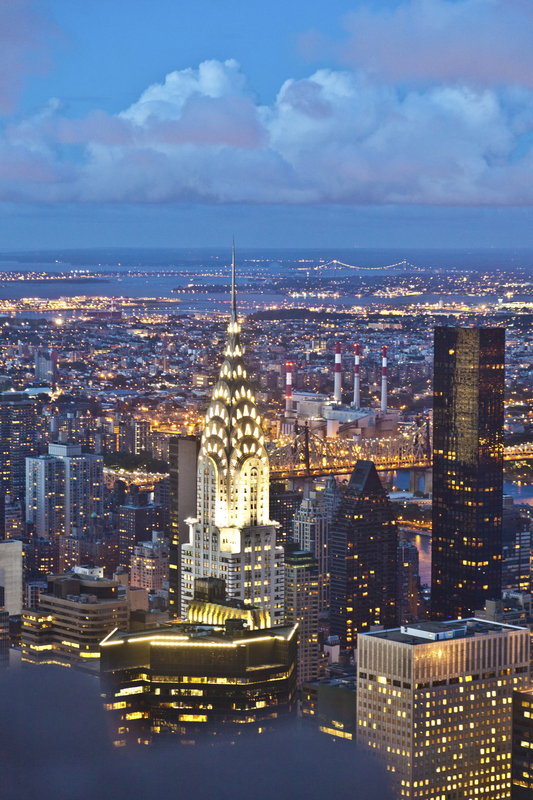 83% have pursued Big Data projects in order to seize a competitive edge. Despite the varying methodologies used in the studies mentioned in this roundup, many share a common set of conclusions. 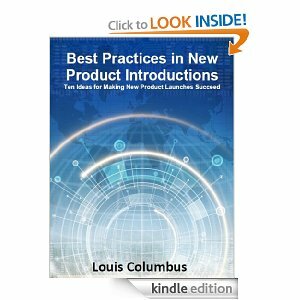 The high priority in gaining greater insights into customers and their unmet needs, more precise information on how to best manage and simplify sales cycles, and how to streamline service are common themes. The most successful Big Data uses cases revolve around enterprises’ need to get beyond the constraints that hold them back from being more attentive and responsive to customers. Wikibon projects the Big Data market will top $84B in 2026, attaining a 17% Compound Annual Growth Rate (CAGR) for the forecast period 2011 to 2026. The Big Data market reached $27.36B in 2014, up from $19.6B in 2013. These and other insights are from Wikibon’s excellent research of Big Data market adoption and growth. 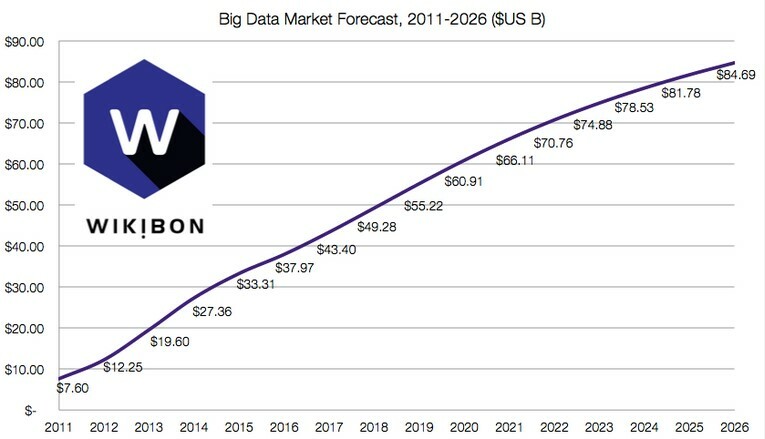 The graphic below provides an overview of their Big Data Market Forecast. Source: Executive Summary: Big Data Vendor Revenue and Market Forecast, 2011-2026. IBM and SAS are the leaders of the Big Data predictive analytics market according to the latest Forrester Wave™: Big Data Predictive Analytics Solutions, Q2 2015. 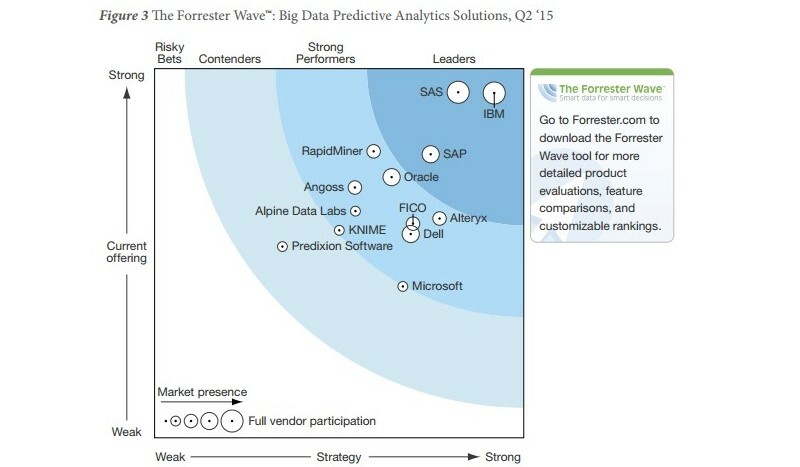 The latest Forrester Wave is based on an analysis of 13 different big data predictive analytics providers including Alpine Data Labs, Alteryx, Angoss Software, Dell, FICO, IBM, KNIME.com, Microsoft, Oracle, Predixion Software, RapidMiner, SAP, and SAS. 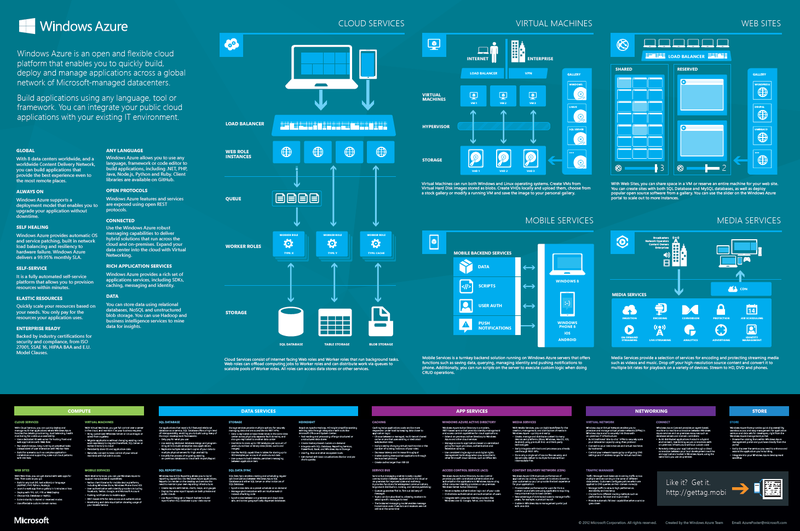 Forrester specifically called out Microsoft Azure Learning is an impressive new entrant that shows the potential for Microsoft to be a significant player in this market. Gregory Piatetsky (@KDNuggets) has done an excellent analysis of the Forrester Wave Big Data Predictive Analytics Solutions Q2 2015 report here. Source: Courtesy of Predixion Software: The Forrester Wave™: Big Data Predictive Analytics Solutions, Q2 2015 (free, no opt-in). IBM, KNIME, RapidMiner and SAS are leading the advanced analytics platform market according to Gartner’s latest Magic Quadrant. Gartner’s latest Magic Quadrant for advanced analytics evaluated 16 leading providers of advanced analytics platforms that are used to building solutions from scratch. The following vendors were included in Gartner’s analysis: Alpine Data Labs, Alteryx, Angoss, Dell, FICO, IBM, KNIME, Microsoft, Predixion, Prognoz, RapidMiner, Revolution Analytics, Salford Systems, SAP, SAS and Tibco Software, Gregory Piatetsky (@KDNuggets) provides excellent insights into shifts in Magic Quadrant for Advanced Platform rankings here. 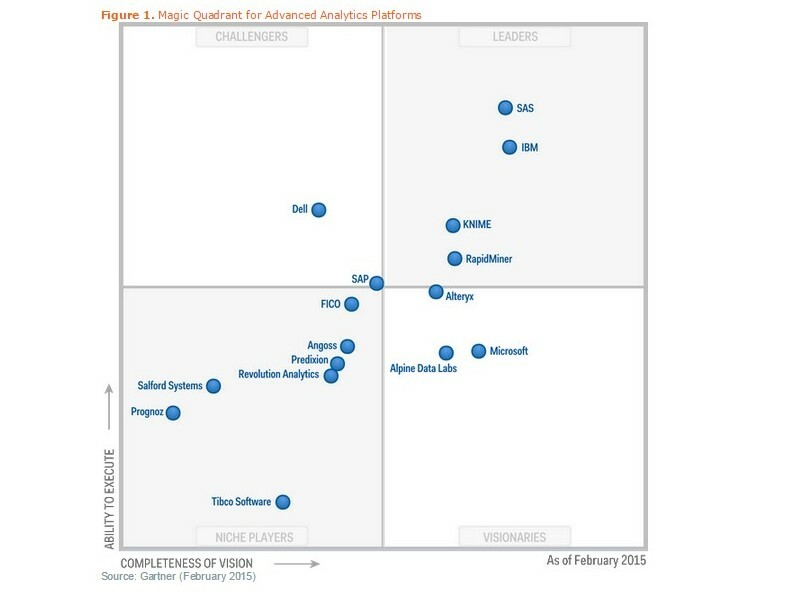 Source: Courtesy of RapidMiner: Magic Quadrant for Advanced Analytics Platforms Published: 19 February 2015 Analyst(s): Gareth Herschel, Alexander Linden, Lisa Kart (reprint; free, no opt-in). Salesforce estimates adding analytics and Business Intelligence (BI) applications will increase their Total Addressable Market (TAM) by $13B in FY2014. Adding new apps in analytics is projected to increase their TAM to $82B for calendar year (CY) 2018, fueling an 11% CAGR in their total addressable market from CY 2013 to 2018. Source: Building on Fifteen Years of Customer Success Salesforce Analyst Day 2014 Presentation (free, no opt in). 89% of business leaders believe big data will revolutionize business operations in the same way the Internet did. 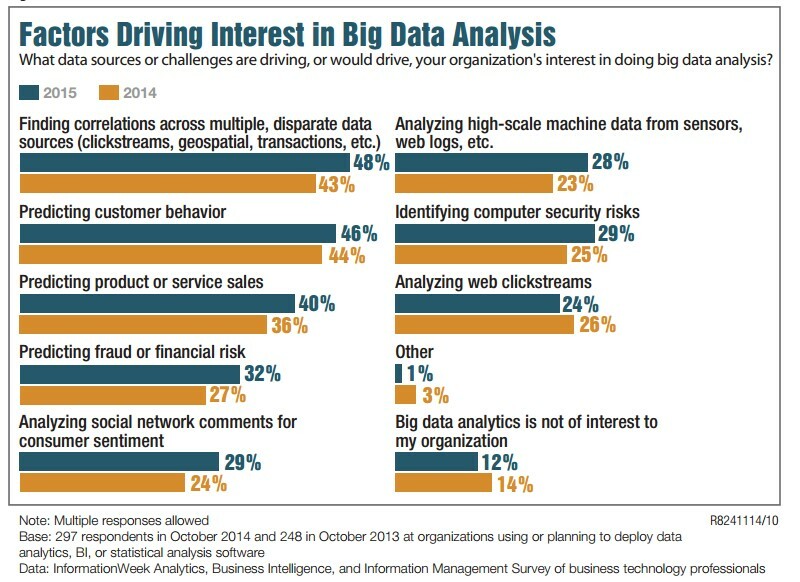 85% believe that big data will dramatically change the way they do business. 79% agree that ‘companies that do not embrace Big Data will lose their competitive position and may even face extinction.’ 83% have pursued big data projects in order to seize a competitive edge. The top three areas where big data will make an impact in their operations include: impacting customer relationships (37%); redefining product development (26%); and changing the way operations is organized (15%).The following graphic compares the top six areas where big data is projected to have the greatest impact in organizations over the next five years. 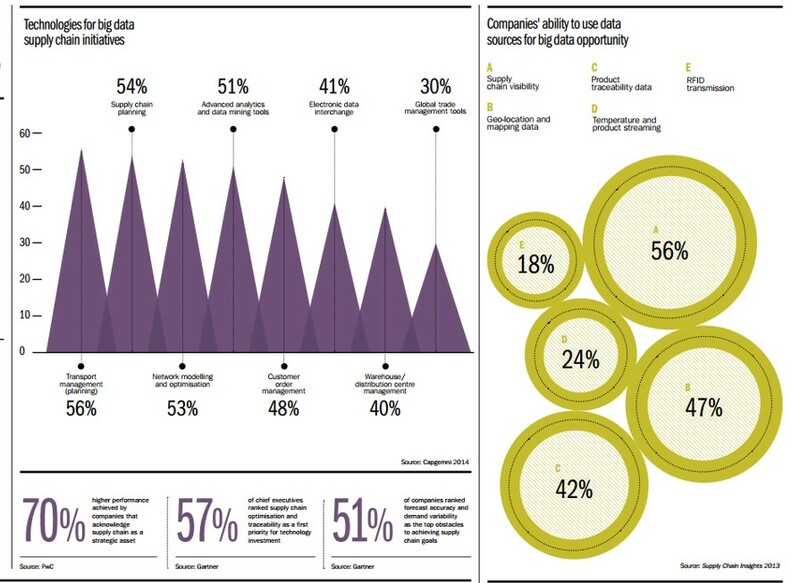 Source: Accenture, Big Success with Big Data: Executive Summary (free, no opt in). 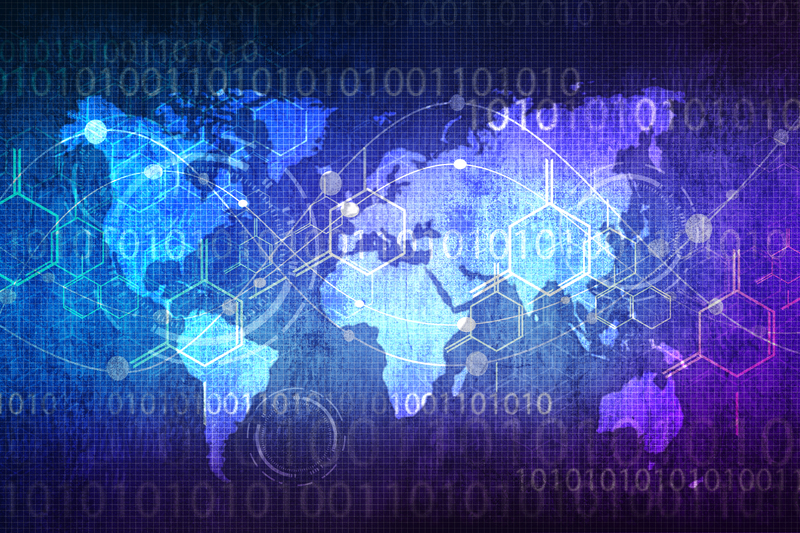 The global Big Data market is projected reach $122B in revenue by 2025. 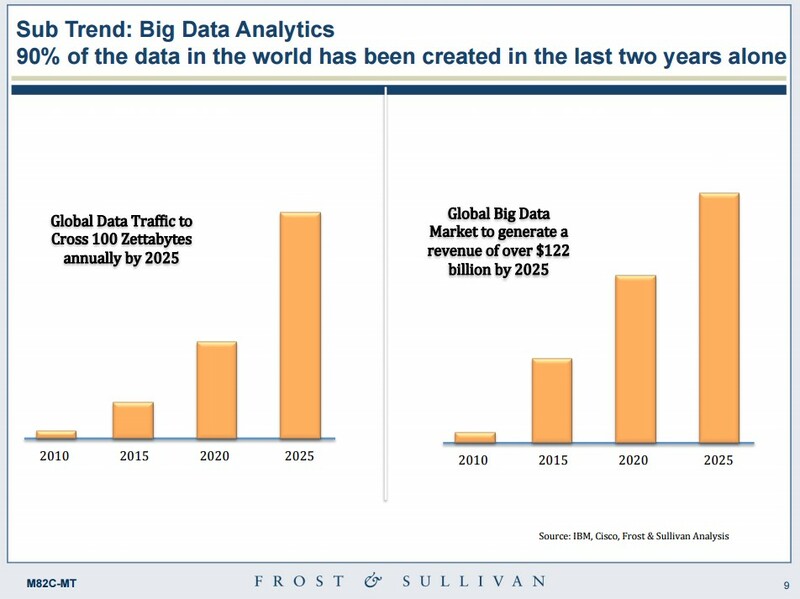 Frost & Sullivan also forecasts the global data traffic will cross 100 Zettabytes annually by 2025. Source: World’s Top Global Mega Trends To 2025 and Implications to Business, Society and Cultures. 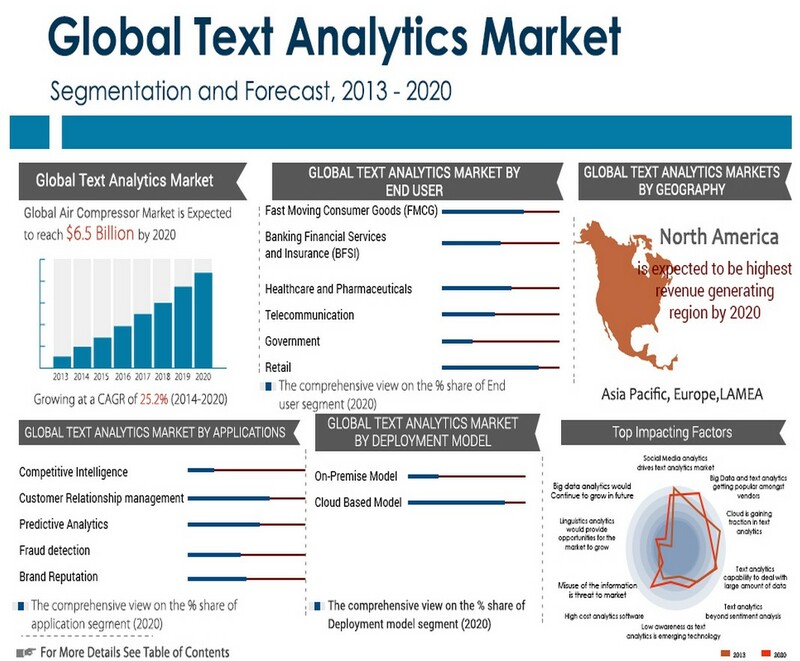 The global text analytics market has a potential to reach $6.5B by 2020, attaining a CAGR of 25.2% from 2014 to 2020. Customer Relationship Management (CRM), predictive analytics and brand reputation are the top three projected applications. The following graphic provides an overview of key findings from the report. Source: Global Text Analytics Market: Text Analytics, Visualizing and Analyzing Open-Ended Text Data. 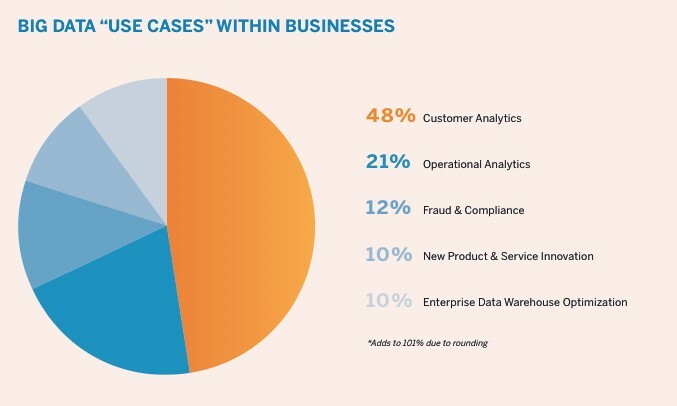 Customer analytics (48%), operational analytics (21%), and fraud & compliance (21%) are the top three use cases for Big Data. 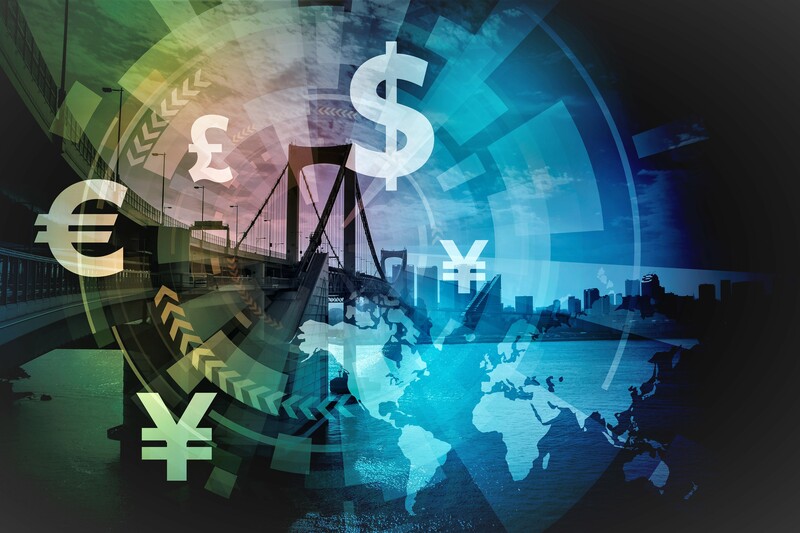 Datameer’s analysis of the market also found that the global Hadoop market will grow from $1.5B in 2012 to $50.2B in 2020, and financial services, technology and telecommunications are the leading industries using big data solutions today. Source: Big Data: A Competitive Weapon for the Enterprise. 37% of Asia Pacific manufacturers are using Big Data and analytics technologies to improve production quality management. IDC found manufacturers in this region are relying on these technologies to reduce costs, increase productivity, and attract new customers. 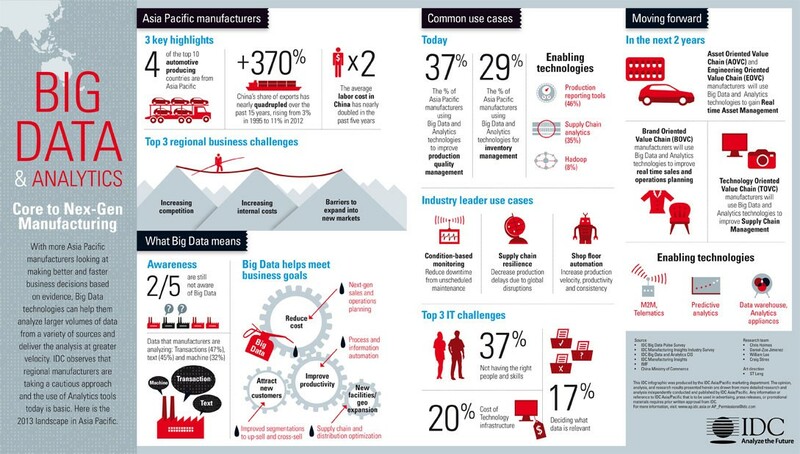 Source: Big Data and Analytics Core to Nex-Gen Manufacturing. Supply chain visibility (56%), geo-location and mapping data (47%) and product traceability data (42%) are the top three potential areas of Big Data opportunity for supply chain management. 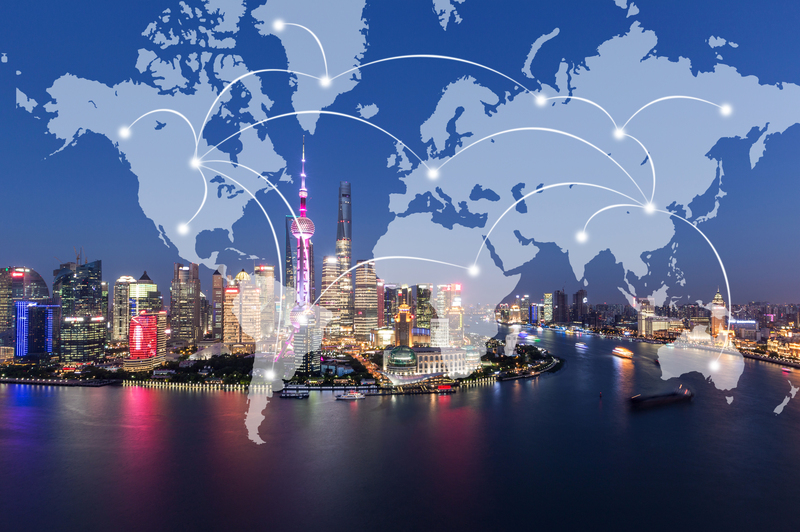 Transport management, supply chain planning, & network modeling and optimization are the three most popular applications of Big Data in supply chain initiatives. Source: Supply Chain Report, February 2015. Finding correlations across multiple disparate data sources (48%), predicting customer behavior (46%) and predicting product or services sales (40%) are the three factors driving interest in Big Data analytics. These and other fascinating findings from InformationWeek’s 2015 Analytics & BI Survey provide a glimpse into how enterprises are selecting analytics applications and platforms. Source: Information Week 2015 Analytics & BI Survey. Banking, communications, media, utilities and wholesale trade increased their use of Big Data analytics the most in the last twelve months. Gartner’s latest survey of big data adoption completed in the 4th quarter of 2014 found that columnar/in-memory databases, high-capacity data warehouses, search-based indexes and log data analytics all experienced greater than 5% growth in references reporting active use. Source: Survey Analysis: BI and Analytics Spending Intentions, 2015, 13 May 2015, Report G00274741 Analyst(s): Josh Parenteau & Rita L. Sallam (client access). IDC predicts the global Big Data and Analytics market will reach $125B in hardware, software and services revenue this year. The professional services-to-technology ratio will also increase 25% this year, due to increasingly complex system configurations and enterprise-wide solutions. IDC also predicts the Internet of Things (IoT) market will also attain a 30% CAGR from 2014 to 2019. Source: IDC Predictions 2015: Accelerating Innovation — and Growth — on the 3rd Platform by Frank Gens & IDC Predictions 2015 Team (free, no opt-in courtesy of SAP).